* not on original LP. The original vinyl record released under this title was made up of parts of a live concert by Murray’s then quartet in one of New York’s famous 70s Jazz lofts, the Ladies’ Fort. I’d been totally immersed in Murray’s 1980 work before I tracked a copy of this earlier recording down, and I can still remember being completely thrown. It is quite remarkable how mature all aspect of the record is. His compositions are some of the most notable of the 1970s, his playing is superb, and the group with then regular collaborators Dara, Hopkins and Wilson is one of the best of this period of jazz for my money. There’s a small, but very enthusiastic audience, and I try to visualise while listening what it must have been like to sit in a large post-industrial New York space and hear this music for the first time. It still makes the hairs on the back of my neck bristle today; how it must have felt to be there watching as well as listening I can only imagine. There are ten versions of ‘Flowers for Albert’ to be listened to on Murray recordings. This was the first time it was recorded. Most bibliographies note that the title track is named after Albert Ayler, and then infer this as evidence that Murray is an Ayler disciple. The fact that Murray played some of his first New York gigs with his near namesake drummer Sunny Murray – who had been the powerhouse of Ayler’s 1964-5 recordings that included the mighty Spiritual Unity – must have made Murray very aware of Ayler. There are also some undoubted comparisons to be made. The obvious one, most often made, is that both men manipulate the saxophone in a manner that pushes it outside its ‘normal’ musical uses. Murray clearly shares Ayler’s early interest in pushing the mechanics of the instrument to do things few other players realised, or even imagined. Less often noted is the strong roots in, and exploration of, gospel music. Or more specifically the aspects of gospel that relate to the emotional power and ecstatic nature of gospel within African American music. However, there are far more interesting things at play here. 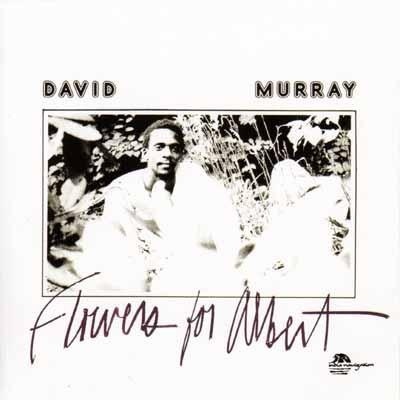 As the title suggests, and as Murray has confirmed in interviews, the flowers are to be left in memorial of Ayler’s death. The melody captures this perfectly. This version start with a Murray solo which tantalises us with fragments of the melody for a good minute before playing it through in its entirety. This is a simple and catchy line, and this interest in song-like melodies is probably the strongest characteristic of all Murray’s work. In interviews Murray tells us that the striking melodic line came into his head as he walked past the place on the bank of the East River where Ayler’s body was found. So, while other commentators make the link to Ayler playing in life as Murray’s major stylistic influence, we should perhaps see the sadness at his death as a catalyst for one example of Murray’s ability to articulate deep emotional responses through musical sound. I’ve several posts on this issue here if you’re interested. The CD version I write about here is expanded from the original vinyl release (the other Murray India Navigation CD re-releases usually cut tracks or performance lengths). This allows us to listen to previously unreleased versions of ‘Santa Barbara And Crenshaw Follies’ and ‘The Hill’ which he was to record again later in his career, and ‘After All This’ which doesn’t seem to have been repeated. The twisted melody of ‘Follies’ precedes a great Murray solo set against marvelous Hopkins bass and Wilson’s skipping drum work and off-kilter punctuation from Dara. It’s a great example of Murray’s earlier interest in hyper-emotional playing around single fragments of the lovely melodies he wrote. Dara seems to understand the process brilliantly, and they pass the solo opportunity on like the baton in a relay. Murray recorded the Hill four times, and on each occasion he produces an epic piece of over 10 minutes. here its longer still at over 17 minutes. The dynamic of future recordings is here from the beginning, but it doesn’t yet have the majesty it would on Ming four years later. I love ‘Joanne’s Green Satin Dress’ which has a great two horn theme and some beautiful playing from both Dara and Murray. Dara was later to be quite disparaging about the music he played during this time, as well as critical of players in the New York loft scene. You couldn’t tell that he was anything but delighted to be playing in this context on this track; and on the rest of the LP. ‘Roscoe’ meanders, but is sustained by a strong individual performance from Murray. It’s more like a sax solo with percussion sprinkles. ‘Ballad For A Decomposed Beauty’ is one of the strongest titled pieces Murray recorded, and the sense of decay and melancholy is apparent in the melody and the playing, especially from Murray and Hopkins on bowed bass. By the way, don’t confuse this recording with the 1990 CD released by West Wind records of David Murray and the Low Class Conspiracy Flowers for Albert. There’s a full discography of India Navigation records for you to peruse.